The definition of a consomme is: “a clear soup made with concentrated stock.” I might add “mind-blowing” to that sentence, especially with this recipe. The key to success– and this is crucial–is to use absolutely garden-fresh, in-season ingredients. If you try this with greenhouse or supermarket tomatoes, you’re just wasting your time. Remove the core of the tomatoes, but leave everything else, including seeds and skin. Put all the tomatoes, basil, horseradish, garlic, vinegar and vodka in a blender or food processor. You might need to do this in batches if your equipment can’t handle it all. Process until you get a kind of slush. 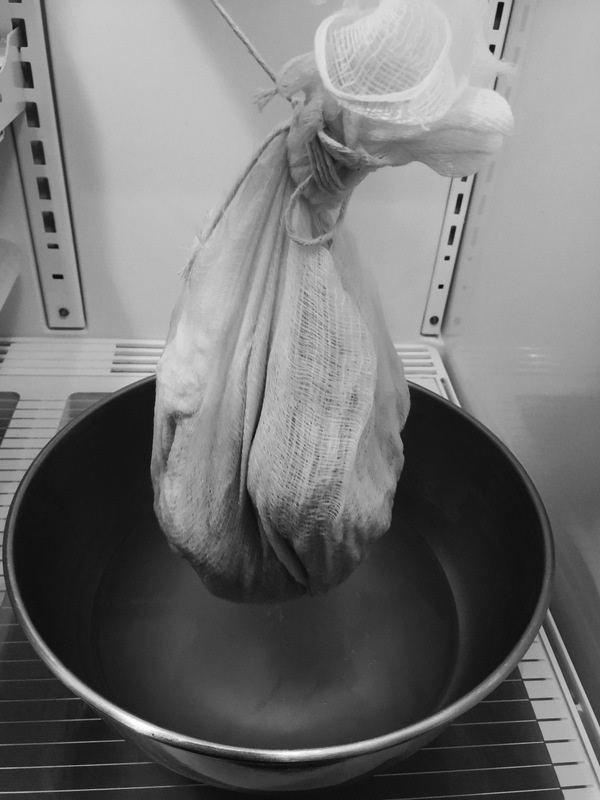 Cheesecloth bundle dripping overnight in the fridge. 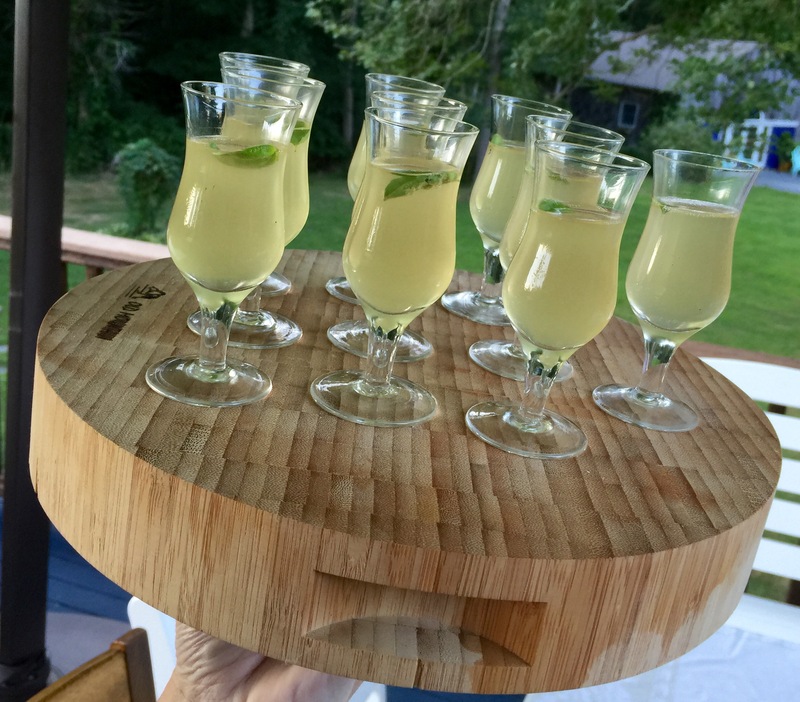 To serve, chill bowls (or in this case: the sipping glasses) in the fridge. When ready to serve, ladle out the consomme and garnish with a tiny basil leaf. A drop of excellent quality olive oil is optional. 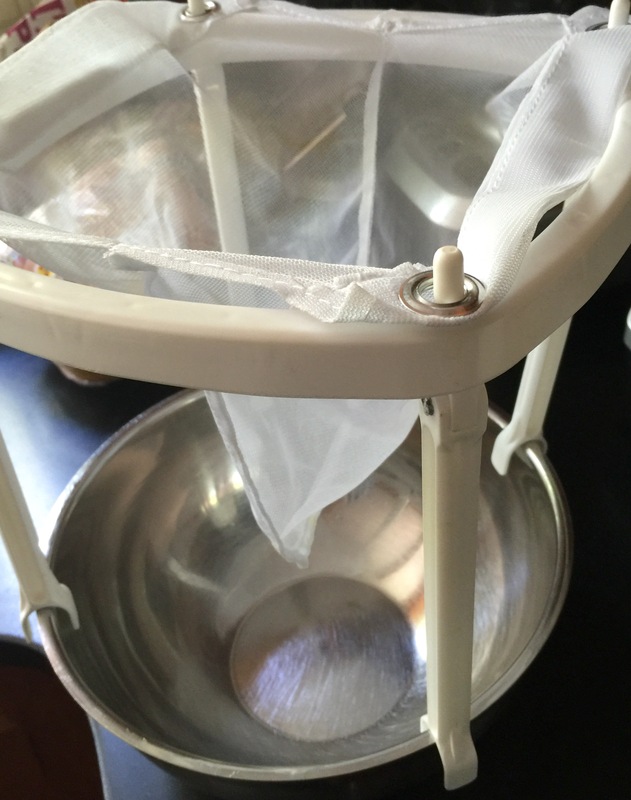 Synthetic cheesecloth apparatus. The real thing works better. I tried using a synthetic cheesecloth for this recipe, and I found that it doesn’t filter out enough of the solids to make a clear consomme. You could use it along with real cheesecloth, just to use the stand, or just hang it all in real cheesecloth, as described in this recipe. Corn and tomatoes…they’re in season and you just can’t beat the combination! This is a very simple salsa that takes advantage of their natural sweetness. If you’re using fresh corn, remove the kernels from the ears by running a knife down the sides, slicing through the kernels. I stand my ear of corn up on the center hole of a bundt pan, letting the kernels fall into the bowl below. Pan sauté the corn for just a few minutes in a little olive oil, but leave it crisp! If you can roast the ears of corn over some coals, even better. Let it cool. 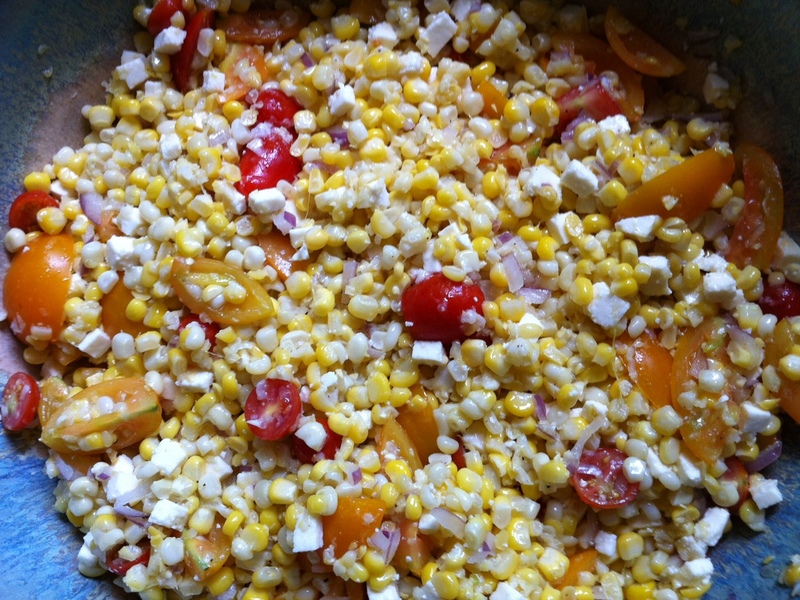 Corn and tomatoes…when they’re in season, you just can’t beat the combination! This is a very simple salsa that takes advantage of their natural sweetness and is easy to make. If using fresh corn, remove it from the ears, then pan saute in a little olive oil, but leave it nice and crisp. If you can roast the ears of corn over some coals, even better. Let it cool. 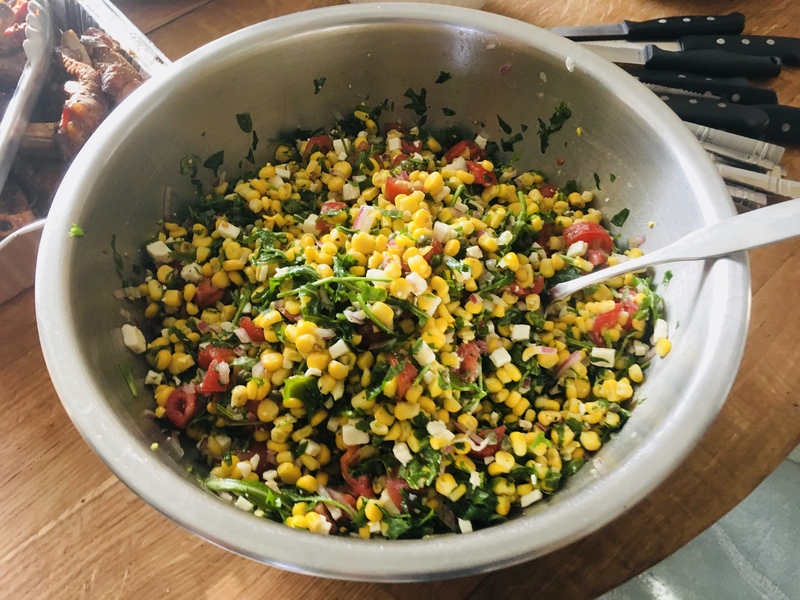 Mix corn with all the other ingredients in a bowl. Cover and refrigerate. There’s something magical about a simple plate of spaghetti and meatballs. When my parents took me to an Italian restaurant as a child, a plate of spaghetti and meatballs made me feel like the luckiest kid on the planet. And even now, when I prepare a plate of spaghetti and meatballs for my 7-year-old daughter, she can’t wait to sit down at the dinner table. She’s so busy shoveling the food into her mouth, she can’t even speak. I just get a quick thumbs-up between bites! Inspired by a lovely but large Italian lady I once knew, my Big Fat Italian Mama sauce is the best tasting sauce I’ve had anywhere. Heat olive oil in a large pot and add the onions. Cook until onions are translucent, then add the garlic. Stir for 10 seconds. Add tomatoes and cook on high until orange foam disappears, stirring frequently. Don’t let it burn. Add oregano, basil, parsley, anise seed, fennel seed, salt and pepper, bay leaves and tomato paste. Allow sauce to just come to a boil so that the tomato paste reaches optimum thickening power. Reduce heat to a simmer and cook for at least an hour, until sauce reaches desired thickness. Stir often. 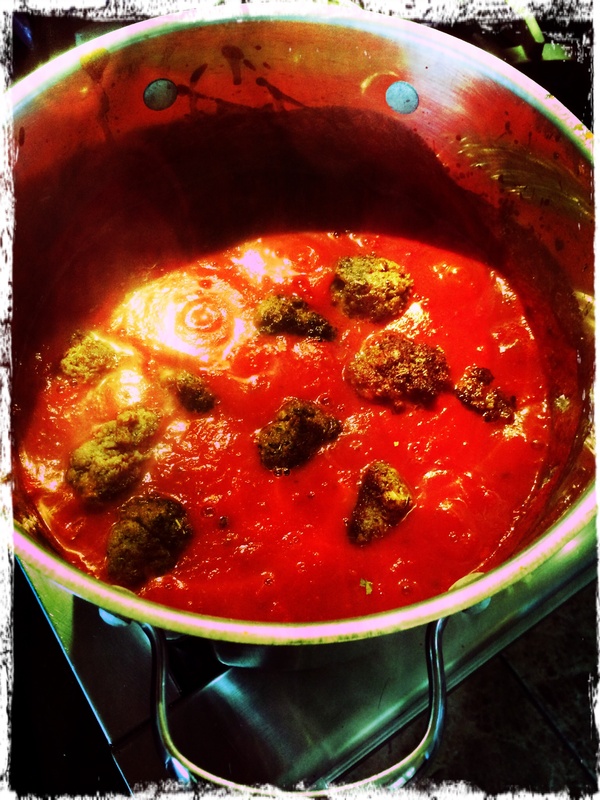 Pour olive oil a medium-hot pan (don’t let it burn), make the meatballs, and sear them on all sides until brown. Cover the pot and cook the meatballs in the sauce on low for a few hours. Pour over pasta, and sprinkle with freshly grated Parmigiano Reggiano.